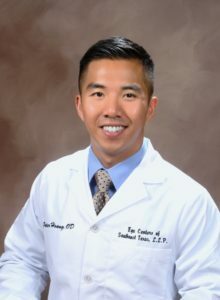 Peter Hoang, O.D. joined our practice in 2012 and is excited to serve the eye care needs of Southeast Texas. Dr Hoang provides comprehensive medical eye care that includes glaucoma management, diabetic retinopathy evaluations, and primary general care. Dr Hoang is also available to manage our ophthalmic emergencies including ocular injuries, traumas, and eye infections. Dr Hoang is a graduate of the University of Texas at Austin. He then attended the University Of Houston College Of Optometry and continued his education with clinical rotations at Advanced Eyecare of Texas, University Eye Instituteof Houston, and University Eye Institute of Dallas. When not evaluating eyes, he enjoys spending his time exercising and promoting proper nutrition.